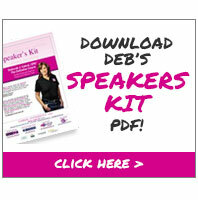 Watch this short video to see some of Deb's speaking engagements! Call today to discuss bringing Deb to your event! The DeClutter Coach will address your group on efficiency, productivity, time management or organizational topics that feature a motivational and lighthearted tone. In her keynote addresses, The DeClutter Coach tailors her message to include relevant topics to groups of any size, age or gender. By sharing her unique story and experiences, The DeClutter Coach reaches individuals and inspires them to find ways to not only improve efficiency, but also to explore and achieve their goals. Let The DeClutter Coach engage your club, organization or business in her methods for increasing efficiency and productivity, using time wisely and being more organized. Her delivery is energetic and sure to please. Sample Topics or We Can Create a Custom Presentation! It Can be Done SIMPLY! Is My Clutter Making Me Sick? Please email us and we’ll contact you!